We’ve just introduced two packages, specifically designed to celebrate extended families. If you would like to bring at least three generations together, click here to find out about our “Family Forever” and “Lasting Legacy” options, which are easy, affordable and offer heirloom wall art and memories for all the family. Whether it’s an anniversary, a “big” birthday or simply a visit from family living overseas, these special occasions are great opportunities to create memories. But however wonderful the day, memories can fade and we forget just how people looked and how happy we felt. We need to make the time to appreciate the special people in our lives and to show our closeness and family bonds. At Timeless Images, it’s our mission to recognise families, celebrate relationships and to create beautiful images which last beyond lifetimes. When people can’t be together - or are sadly lost to us - wall art is a daily reminder of those we love and the legacy of family. Mark these celebrations with more than snapshots and Facebook updates! A portrait of your extended family portrait will make you smile, keep you close and show what - and who - is important in your lives. It’s already the middle of January and we’re settling into a new year! We hope you had a fabulous break across the festive season and a great start to 2018! Time to relax, time to reflect and time to make some resolutions or intentions going forward. 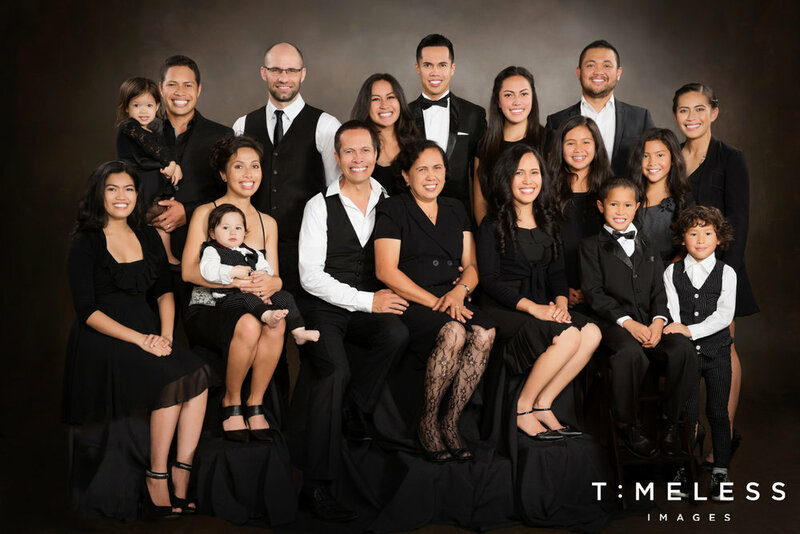 Time is really important to us at Timeless Images – we believe that by capturing a moment, we help to create memories which become the legacy you leave to your family. We take the time to get to know you and your family – and our portraits reflect your unique stories. In our Planning Consultation (a pre-shoot discussion, in person or over the phone), we find out all about what’s important to your family, so that we can bring out your interests and stories in our photographs. We won’t rush you in your Photography Session, but will take the time to help you to relax for beautiful, natural smiles. And in our Design Consultation, we’ll give you the time to select your favourite shots and guide you through the best way to display them, to suit your home and lifestyle. Displaying beautiful wall art encourages your memories to be shared and to live on… triggering those precious “remember when?” discussions. Isn’t it time for your family to immortalise your stories? Gift certificates now available for only $89, including Planning and Design Consultations, your Photographic Shoot and a 5x7” print. Why is graduation so important? We believe in celebrating wins and honouring milestones. Graduation is one of the big ones! A great way to mark it is through portrait photography. Why is it so important to celebrate graduation when you're an adult student? We believe in celebrating wins and honouring milestones. Our passion is preserving memories for decades to come. Timeless Images have enjoyed long associations with the University of Auckland, Massey University and many other tertiary institutions. We believe your Graduation photographs encourage and inspire others to recognise the importance of education and lifelong learning, as well as illustrating your family’s pride in your special achievement – no matter at what age you’ve graduated. Too book a photography portrait session please phone 09 950 4675 or bookonline. There are various stages during the first 18 months of a baby's life that are GREAT moments. We've outlined them below as our favourites. This does not mean you need to have professional photographs done at every moment, but they are key moments to key an eye out for. Have your own camera ready, or come and visit us, but whatever you do CAPTURE them! As a newborn (first 10 days old), at 4 months (chubby, cheeky smiles), followed by 6 or 7 months (sitting), 9 months (crawling), then 12 to 13 months (standing). If you have to choose – make sure to get the newborn, 7 months before they’re crawling, and again as a one year old. Below is a guide of what to expect in baby photographs and the different stages of the first year and half of their life. Newborns: Small and new, newborns are so delicate and fragile. For newborns, the ideal time is in the first 10 days, although up to three weeks is still OK. At this time they’re still sleepy and very small. This is an incredibly precious time and should not be missed. There’s a lot we can do at this age - detail images, the baby in the arms of the family, and proud parents. A black backdrop provides lovely creative newborn photographs. 3-6 months: Smiles and funny faces - they’re starting to show expression. In most photographs, the baby will need to be propped up. We can get very cute photos of them wrapped in rugs and capture those adorable chubby cheeks. 6-7 months: Your baby is starting to sit at about this age and there are more options and expressions for us - lots of laughs and smiles. Outdoor sessions are now possible. 8 to 10 months: Babies are often crawling and full of energy, and we have loads of photo opportunities with toys and various props to entertain them. Their personalities and characters are now shining through. A crisp white backdrop is often ideal for a clean, modern look. 11 to 16 months: Babies are standing at last, or at least able to hold themselves up and maybe walk - a huge milestone! This is a great time to include extended family and take advantage of the outdoors. Our award-winning wedding photographer, Lisa Harrington understands better than anyone the importance of a stunning backdrop. For this reason she was recently included in an article by Expedia on the most scenic locations for photoshoots in New Zealand, 'Photographers Share New Zealand's Most Scenic Locations'. The article offers inspiration for budding photographers planning a trip to New Zealand and while New Zealand’s rural areas are well-known for their outstanding natural beauty, many of its towns are also a sight to behold. If you’re planning a holiday amidst any of our stunning urban landscapes, don’t forget to pack your camera! For Lisa, the nature of the subject is ultimately what helps her decide what kind of background will suit the shoot best. Relaxed couples look at home barefoot on a pristine beach, whereas a more traditional couple will glow in front of a historic church or elegant house. Check out the article by Expedia for more stunning photogenic destinations in New Zealand. Graduation season has started, and is one of the most exciting times of our photographic year! We are the official photographers for the University of Auckland, and very proud of the work we do. Remember to book in as soon as you can for your graduating portrait. Especially those of you from overseas who would love to share the moment with family and friends who cannot be there – the gift of a portrait of you on such a special day would be perfect. We have a convenient studio location in Newmarket and a couple of favourite outdoor spots such as the Auckland Domain. Isn’t graduation just wonderful! An incredible milestone - one to be remembered. It's a time for you and your family to celebrate, and a portrait will capture this moment forever. It seems this is the week when new school uniforms are purchased, along with new shoes, books and bags. All fresh faced and ready for the world! It’s nearly that time again - back to school. Perhaps this is the start of a whole new chapter or adventure for your children, if they’re starting school, moving up to Intermediate, going to College or embarking on their first year at University. How proud are you? Mark this special time in their lives with a beautiful portrait to hang on your wall – as well as giving photographs to grandparents and other important family members in your children’s lives. As your children mark off their milestones, you can create a photographic journey that will last a lifetime. This is the best time to have a piece created for your family photo wall or album; everyone is full of excitement, and energies are high. Your photographs can be taken in the studio, outdoors at one of our favourite locations, or at a nominated special place of your choice. 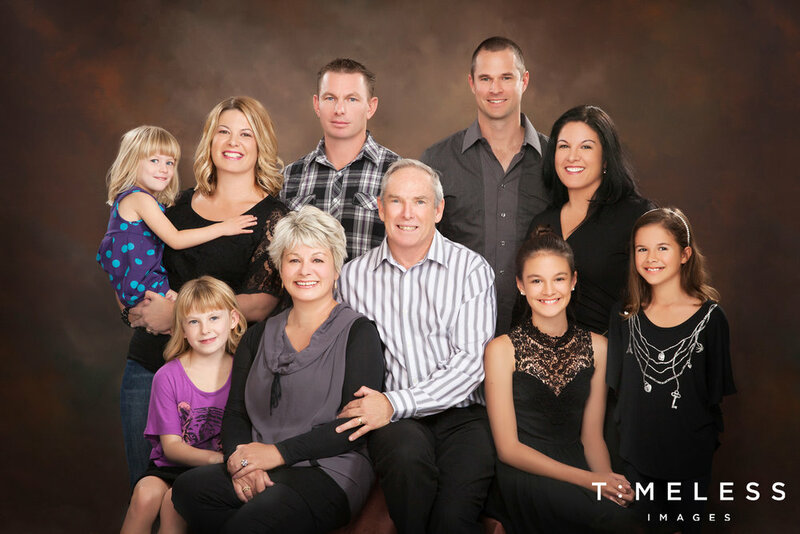 Check out some examples below and on our family portraits page. We love working with this wonderful energy, and results are fabulous. September 30 was a proud day for so many University of Auckland graduates and their families. Timeless Images spent some time talking with graduates about their experience and was thrilled to be the official photographer for the event. Redspark created my logo nearly 3 years ago and I love it! I love it because people remember it. What I also love about this business is how easy they are to work with and how after 3 years I can phone them up and ask a favour and it’s absolutely no problem. Great service! RedSpark Creative is a graphic design, branding and advertising firm founded in 2005 by award winning seasoned creative director Ross Murray. They’re a friendly & approachable team, providing top quality graphic design, branding & advertising services at a fair price. ‘We provide brand-building campaigns for clients in New Zealand and the US to build their brand equity, which helps translate into future sales for their business. From brand development and re-branding to advertising and special design projects, we have the creativity and innovation to get you and your company noticed,’ he says. If anyone requires a graphic designer with a difference Phone 09-337 0305 to make an appointment for a free consultation. You won’t be disappointed – Just love my Timeless Images logo. Thanks Ross! I love it when customers come dressed in their national costume. David Mackintosh is the perfect example. From Inverness, clan Chattan, David wears his Sporran and Highland Dress and promises he’s a real Scotsman wearing nothing under his kilt, not that I got to see …..
Now available at Timeless Images Photography. Virtual backdrop technology is a projected image on a special retro-reflective screen that appears behind the subject. The screen is 1,000 times more reflective than an ordinary white background and can replace just about every other background. This technology gives our customers more choice and variety in their personalised portrait sessions. The below video clip shows the use of virtual backgrounds in the movie The Great Gatsby. It's cutting edge and the possiblities are endless. A virtual background is a projected image the client can stand in front of. The decision to invest in Virtual Background technology enables Timeless Images to offer a more creative background. Clients can choose from a large number of scenes and can have multiple backdrops in one photography session. The benefit for the customer is variety. The benefit for Timeless Images is that we can offer a number of locations in the warmth of a studio, thus reducing cancellations due to weather and wind. The possibilities and potential with this are phenomenal! Virtual Backgrounds is an Image Enhancement System that enables professional photographers to be more creative by projecting a background, live, behind the subject, working in a controlled environment where the photographer has total control. Light is projected through a transparency, on to a beamsplitter, and then on to the special projection screen behind the subject. The background screen is composed of billions of perfectly round glass beads that are more than 1,500 as reflective as white background paper. It is retroreflective. Kathy is a very special client who came to us with her sister Kerry on her birthday for a fun day of makeup, hair, pampering, and photography. Her spirit and energy shines through, and for this reason I'm keen to show her business. I couldn't think of a better person to marry a couple in love! She is also an active member of Zonta International - a global organisation working to raise the status of women worldwide. Her attention to detail and ability to recognise and include the special qualities of each couple will ensure that your wedding ceremony is the one you've always dreamed of! "After 40 years in the business world, I decided some years ago that it was time for a change. There comes a time when corporate demands hold little attraction and a less stressful and more balanced lifestyle looked tempting. Being a Marriage Celebrant allows me to use my natural abilities and creative energy for a very good purpose and I have the intense satisfaction of knowing that I provide the best possible service for your special day." A wonderful lady, with a great spirit! So it was wonderful to meet young mum Lauren in the studio a few months ago. After the birth of her two young children, 30 year old Lauren had lost a significant amount of weight - well over 21kgs (way to go, Lauren!) and in recognition of this achievement she wanted to treat herself to some beautiful portraits. Which of course, she absolutely did! Lauren started the Beauty Makeover day full of excitement, masquerading as nervous energy. "I didn't know what to expect. I didn't know how it would turn out - after all I'm not a model!" But as the day progressed she relaxed into allowing other people to take care of her, styling her hair and doing her makeup. "It was so nice to be pampered. The kids are full on and it was brilliant to be able to take time out from that responsibility and to have me looked after." And then it was time for the photo shoot. "It wasn't at all what I'd expected. In fact, it was like we were just goofing around! Lisa was so much fun that I even had a sore mouth from laughing." The result is, of course, beautiful portraits that everyone loves. "My husband thinks they're wonderful", she says shyly. But perhaps even more importantly, Lauren has such great memories of the day that she has considered having her portrait taken again when she turns forty. "It was a brilliant experience - it really builds your confidence and it's a great way to record how you change over the years." Now pregnant with baby number three, Lauren has her hands completely full - but we're delighted she grabbed this opportunity to let us pamper and photograph such a busy nurturing mum! Gail Powell's family is grown and her 'hands-on mothering days' may well be over, but she has turned her hand to growing her local community, and in particular her community's garden. As a mentor for the Charntay Gardens at the Te Irirangi and Great South Road intersection under the Redoubt Road overpass, Gail opens the tool shed twice a week to the multicultural novice gardeners tending their plots. "It's a great community scheme and so very popular the council has even had to create new smaller plots to try and meet the demand," she said. The Community Gardens scheme operates in various parts of South Auckland including Mangere and Middlemore and aims to teach locals how to tend the soil and grow produce and of course take home what they've learnt and grown. Gail's role as mentor involves teaching good garden maintenance, composting and how to combat pests and diseases. "It's a great multicultural atmosphere," Gail says " We have everyone from Zimbabweans, Asians and Fijians all working side by side and producing some amazing crops. Okra, sweetcorn and bok choi were particularly good this season!" Gail's interest in the Community Gardens programme seems a natural development from her years growing fruit on the family's Whitford orchard, which was the location for her recent family photos which Timeless Images shot for her. It seemed fitting that the orchard should feature, given that the farm was central to their family life in New Zealand, and is still home to their grown sons. "I've wanted family portraits taken for some time, but it never seemed to be right - and then all of a sudden it was. Our son recently celebrated his 21st and whilst all three of them were home, I grabbed photos of us all. It was a fun session, Lisa made us all feel very relaxed, which I think you can see in the photos. They really are us." "I'd recommend having your family photos taken to anyone. It's an important time when they're all spreading their wings, a real milestone. I wanted to capture this time quickly before it's gone." 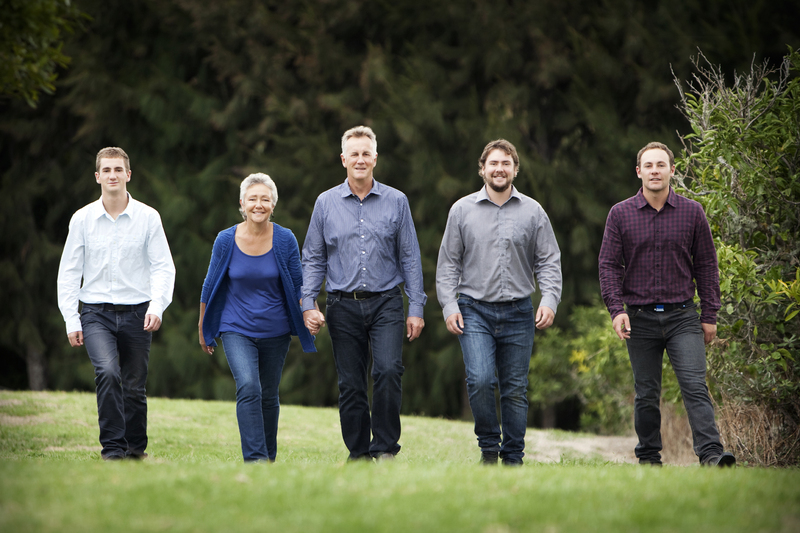 We think the family photos are beautiful, warm and natural and of course the backdrop of the rich green land plays an important part - it's a tribute to the family's life together growing up in New Zealand. The photos are like a time capsule that each member of the family can look back on and remember the growing years. But for Gail, her growing and nurturing years are not entirely over - it's back to the Community Garden with her green fingers to help in the raising and growing of a different community kind! "I was a bit nervous," admits Maraetai resident, Julie Smith, reflecting on her Beauty Photo Shoot with Timeless Images. "But they've ended up being the best photos I've ever had taken." We were really pleased to hear that because Julie's Before and After photos have drawn a lot of comment from visitors to our Howick studio. Maraetai based Julie owns Spirit Hairdressing and runs the popular Whitford General Store with her husband, and she spends a great deal of her business life caring for others so the Beauty Photo Shoot felt very special - a day of other people pampering her. "It was a little bit like being a film star and it was lovely having someone else fuss over you and do your hair and makeup. Though it was strange to be the centre of attention. I was grateful to Lisa too for suggesting I bring fitted clothes to the photo shoot. I typically wear comfy casual clothes and when I look at the Before and After photos I realise the fitted clothes are really flattering!" Julie's day started with a full makeover and hair styling session that focussed on bringing out her personality and inner beauty, rather than creating a glamour starlet style for her. Her makeup and hair styling is natural and because her clothes are from her own wardrobe, not only do they look right and express her personality but they help her relate to the images. "I think the photos are really natural, which I love. I still sometimes look at them and go 'wow that's me'. They would be a perfect way of celebrating a major weight loss, or change of style or even as professional publicity photos." After Julie's makeover session her photo shoot started and finished, surprisingly quickly. "It was a really nice day, even though I think that was also the day my car blew up," she laughs. "But after that kind of TLC I think you can laugh off most things." "Lisa is so down-to-earth, she really makes you feel comfortable and calm. She worked amazingly quickly and before I knew it the shoot was over. All up, I think it only took a couple of hours. I don't think I had time to really feel on edge, but I definitely didn't feel rushed. It was actually a lot of fun. And her instructions were spot on. I've learnt how to hold my head at an angle and where to position my body, which will be helpful advice for any photos I might have taken in the future." And the resultant images are beautiful! Julie gave one to her mother and has hung a number of images in her home. One picture in particular holds a special place in her heart. "I hung the one of me in the black spotty dress in the hall and every time I walk past it, it makes me smile," she said. And that's what photos of us are supposed to do. Remind us of who we are - beautiful both inside and out. As we all know they are wonderful as gifts to those who love us, but sometimes even better as gifts to ourselves. Be your own best friend, Call us at Timeless Images and gift yourself a Beauty Photo Shoot. Quick we're turning the Howick studio into a PhotoKids Fun Day space on Monday 27th and Tuesday 28th May 2013, so book your kids in and get a $30 photo and the chance to win over $5000 in travel prizes. PhotoKids is a wonderful annual competition in support of Cure Kids, the health charity that has already made great strides in fighting childhood Leukaemia, Long QT Syndrome, Cystic Fibrosis, cot death and severe asthma. Getting involved is easy. Simply phone and boook your kids into the Timeless Images' Studio between 1.00-6.00 pm on Monday 27th and Tuesday 28th May 2013 and we'll take a beautiful portrait photograph of them for only $30 - of which every last cent goes to Cure Kids! Do you have kids aged between 0-19 years? Then bring them along to the studio! Teens, toddlers, babies, bring them all. Your kid could be the PhotoKids 2013 winner! After your photo shoot you will choose the best photo of your child, which we will then enter into the regional competition. Voting in the competition is public, so once your child is entered get all your friends, family and whanau to cast a vote in your child's favour. The top three placed photos from the regional vote will be entered into the nationwide June competition and the ultimate winner and their family will receive over $5000 in travel prizes. One of the stand-out family portrait sessions last week was this photo shoot featuring four generations of Sandra Hickey's family. "It was Nana's idea, originally. She had been asking to have our photos taken but it didn't ever seem to be the right time," Sandra says. The 'right time' came when Sandra went to get photos taken for her graduation, (she recently graduated with a Masters in Official Practice) and she realised having the family portrait taken was an investment in her family's history. "My grand-daughter Riyah is only one and Nana is still with us. It just seemed right. I know that we needed to capture the moment." The resultant portraits are beautiful representations of four generations of strong women in Sandra's family - each character resembling each other with their dark eyes and zest for life. "The quality of the print is so wonderful that I know it will last forever, unlike a quick digital print." Like many of us Sandra is not fond of having her photo taken but she says she reminded herself that she would appreciate it in the end. "I knew I'd look back and be glad we did it. I literally talked myself into it. At the time you're quite critical of yourself, but later you look back and think 'huh so that's what other people see in you when they say you look great'." "It's capturing that moment in time, that sparkle in Nana's eyes, or Riyah's laugh." Sandra was particularly thrilled with the way the photographer was so skilled at encouraging the baby to laugh and at making the whole family group feel at ease. "Our photographer took great care in making sure that we were all positioned well and it was as if she really understood how important these photos were going to be to us as a family. The value of them. They tell our story at this moment of time," Sandra says. "It's an investment in our family history. Something we will treasure forever."